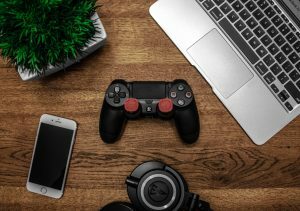 What can instructional designers learn from video game design? This might seem like a silly question—what do video games have to do with learning? Why might we use video games as an inspiration in pedagogy? As instructional designers, faculty often come to us with a variety of problems to address in their course designs—a lack of student interaction, how to improve student application of a given topic, and many more. While there are many tools at our disposal, I’d like to propose an extra tool belt for our kit: what if we thought more like game designers? Video games excel at creating engaging and motivating learning environments. Hold on a minute, I hear you saying, video games don’t teach anything! In order for games to onboard players, games teach players how to navigate the “physical” game world, use the game’s controls, identify the rules of what is and is not allowed, interpret the feedback the game communicates about those rules, identify the current outcome, form and execute strategies, and a large variety of other things depending on the game, and that’s usually just the tutorial level! What is the experience like in a learning environment when students begin an online course? They learn how to navigate the course site, use the tools necessary for the course, identify the assessment directions and feedback, identify the short-term and long-term course outcomes, learn material at a variety of different learning levels, and large variety of other things depending on the class, and that’s usually just the first week or two! Sound familiar? What are some things that video games do well during this on-boarding/tutorial to setup players for success? And how might instructional designers and faculty use these elements as inspiration in their classes? Early tasks are very simple, have low stakes, and feedback for these tasks is often very limited—either “you got it” or “try again”. Consider having some low-stakes assignments early in the course that are pass/fail. If negative feedback is received (dying, losing a life, failing a level, etc. ), it is often accompanied by a hint, never an answer. If you have a MCQ, do not allow students to see the correct answer, but consider adding comments to appear if a student selects an incorrect answer that offers hints. If negative feedback is received, the game does not move on until the current outcome is achieved. Allow multiple attempts on quizzes or assignments and/or setup prerequisite activities or modules. Game levels allow for flexible time—different players complete levels at different rates. Design tasks with flexible due dates. Many courses already allow some flexibility for students to complete activities and assessments within weekly modules—can that flexibility be extended beyond a weekly time frame? Tutorial quests usually have predetermined and clearly communicated outcomes. All objectives are observable by both the game and the player. Create outcomes and rubric conditions/language that are self-assessable, even if the instructor will complete the grading. Tasks and game levels are usually cumulative in nature and progress using scaffolded levels/activities. Consider breaking up large assignments or activities into smaller, more cumulative parts. Make your way to the keep. Enter the Keep with Hadvar or Ralof. Find some equipment (Hadvar) / Loot Gunjar’s body (Ralof). Optional: Search a barrel for potions. Optional: Pick the lock of a cage. There are varying degrees of assumed prior knowledge, but no matter what, everyone participates in the tutorial levels. They are not optional. Consider saving optional “side quests” for later in a course or having an introductory module for everyone, regardless of skill level. The “tutorial” process usually ends when all skills have been introduced, but some games continue to add new skills throughout, inserting mid-game tutorials when necessary. Return to some of the design ideas on this list if a course introduces new topics throughout. After a requisite number of skills are mastered and players are able to fully play the game, the only major changes in design are increases in difficulty. These changes in difficulty are usually inline with maintaining a flow state by balancing the amount of challenge to the skill level of the player. As course material and activities increase in difficulty, make sure there are ample opportunities for students to develop their abilities in tandem. Games are a great model for designing engaging learning experiences, with significant research in psychology and education to back it up. By understanding how games are designed, we can apply this knowledge in our course designs to help make our courses more motivating and engaging for our students. Gee, J. P. (2007). What video games have to teach us about learning and literacy. New York: Palgrave Macmillan. This book is an entertaining read and an excellent place to begin learning about the possibilities of game design in learning. Rigby, S., & Ryan, R. M. (2011). How video games draw us in and hold us spellbound. Santa Barbara: Praeger. This book is another excellent introduction based around Deci & Ryan’s Self Determination Theory (SDT) and how the framework for SDT is observed in different games. For an illustrated video of Ryan explaining the basics of SDT, click here. Ryan, R. M. & Deci, E. L. (2000). Intrinsic and extrinsic motivations: Classic definitions and new directions. Contemporary Educational Psychology 25(1), 54–67. Failure is an essential part of learning in games—this short book dives into how failure is communicated during games and how games create safe places for failure. Csikszentmihalyi, M., & Csikszentmihalyi, I. S. (Eds.). (1988). Optimal experience: Psychological studies of flow in consciousness. Cambridge: Cambridge University Press. Chapter 2, “The Flow Experience and its Significance for Human Psychology”, is a great starting place if you’re interested to learn more about Flow Theory from a primary source.